Here is my code for making an Hour Glass pattern with odd or even input using Python. I think I could make it simpler. Read PEP8, it will give you directions on how to write Python code that look like Python code to other. Now you can make use of itertools.chain instead of list concatenation and turn your function into a generator to separate computation from printing. instead which may be slightly more readable. Not the answer you're looking for? 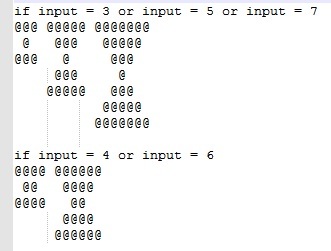 Browse other questions tagged python ascii-art or ask your own question.